Murray manufactures a number of push and riding lawnmower models that feature Briggs & Stratton engines. 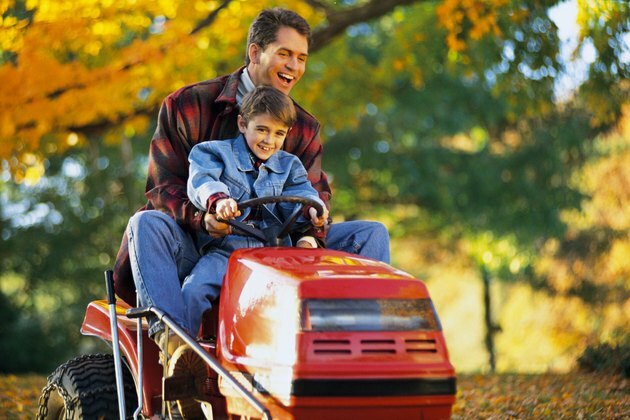 Your Murray riding lawnmower can fail to perform properly for a number of common reasons related to the carburetor. You can keep your Murray riding lawn mower's carburetor and your lawn in good condition without the help of potentially expensive manufacturer repairs. You can repair your Murray riding lawnmower's carburetor on your own time regardless of your familiarity with mower carburetors and related mower parts. The Murray riding mower's carburetor may lack the proper air intake. Power off the Murray riding lawnmower and open the hood over the front engine. Find the carburetor. The Murray's Briggs & Stratton engine will have its carburetor along the middle of the engine's right side. It features a distinctive bowl-like shape. Turn the needle valve on the bottom of the Murray riding lawnmower's carburetor to the right until you can no longer twist the valve further. Twist the valve two turns back to the left, and then attempt to run the Murray riding lawnmower. Listen to the mower and see how well it runs. Check for any engine sputtering. The carburetor's needle valve controls the intake of air into the engine. This intake must be set correctly for the Briggs & Stratton engine to run smoothly. Twist the carburetor's needle valve to either side to further adjust the air intake, and then attempt to run the mower again. Unscrew the fuel cap on the gas tank if the Murray riding lawnmower is still not running properly. Notice the small hole in the tank's cap. This is a vent hole that controls air intake into the gas tank, which is eventually passed along to the carburetor. Ensure this vent hole is not blocked. Insert a pipe cleaner or similar small brush device into the vent hole to clean it out. Screw the fuel tank cap back onto the Murray mower's tank. Place a pan under the carburetor. Examine the bowl of the carburetor and loosen its bottom nut using a socket wrench. Allow all the gas to drain out into the bowl. Take out the Murray riding lawnmower's carburetor nut altogether and clean it out with a cloth. Put the bowl's nut into some carburetor cleaning solution and scrub the nut with a wire brush to clean any build-up. Reset the Murray riding lawnmower's carburetor bowl onto the engine and tighten it into place by replacing the nut with your socket wrench.